As I enter Luc Coeckelberghs’ studio, I see three small paintings that immediately capture my imagination. The first one has a geometric shape but it is neither a rhombus nor a rectangle. Looking at it, my eyes are drawn to what appears like, very nearly, a square that is traversed by warm red lines running down vertically, next to each other, leaving space for thin, violet stripes of color. But then, a narrow, elongated triangle seems to be ‘added’ next to this almost square-shaped, warmly violet rectangle. It is pointing towards the ground. A certain blue with a tinge of violet colors this triangular part of the work. And stepping closer, I recognize that it is also the color of the vertical stripes in the almost square-shaped part of the painting. But there, it appears to me as more ‘violet,’ apparently because of the inserted, red lines. The fact that the surface color of the entire work appears in its purity in the triangular part to the right of the larger, almost ‘square-shaped’ section, whereas it is affected by the presence of the horizontal lines in the latter, makes me curiously aware of the interaction of color. The subjective perception of color is affected by it, especially if I don’t approach the canvas very closely. I also notice how the very fact that the small canvas is not a rectangle brings a certain, dynamic quality to the work. The next painting does something of the sort, again. There is a square-like middle part of the painting, and blue stripes of color stand out in it because this blue part is traversed by thin, red, vertically oriented ‘threads’ or ‘traces’ of color. To speak of lines would be too much, too inaccurate. The abstract purity of thin, completely straight geometric lines of an exact and equal width has been avoided. These trickles of red color running down vertically, leaving a thin trace, obviously have not only produced the effect of blue bands or stripes of color that are left where the red trickles did not cover the blue of the surface. They have also affected the color pecerption with respect to these blue stripes, creating an overall impression of a strange, warm blue crossed by these reddish threads. Both to the right and left of the central, almost square-shaped part of the painting, a triangle executed in a beautiful turquoise color has been added. The two triangular sections are of exactly the same size and they are obviously characterized by their ‘sharp,’ acute angle. A nearly square-shaped center, with a triangular addition on either side produces of course a sense of harmony, of equilibrium, both in terms of the distribution of visual forms and of colors. But the existence of the two triangles also brings a dynamics into the painting, especially insofar as one triangle points to the sky, the other to the ground. The overall shape of the painting thus appears as that of a rhombus. The shape chosen for the canvas challenges the idea that paintings have to be square or rectangular. The third work is a small but enchanting one, too. It is elongated; it is oriented vertically; the shape is obviously geometric, but complex, perplexing. Three panels, each one smaller than the preceding one, have been mounted on top of each other. * Of course, we see only a bit of the bottom one to the right and left of the other two. We see its Prussian blue in all its intensity. On top of it is the black canvas, and again on top of this, the light blue one. Watching closely I notice that the blue incorporates a faint trace of turquoise. or edges of each canvas as we look at the work a little bit from the left or right. As always, the texture of the surfaces matters a lot for the artist who has produced this work. It is rich and sensuous. The effect is that what Luc Coeckelberghs has created is not at all a sparse, minimalistic work. It is not tending towards abstraction but embracing a love for the concrete. What I see is a three-dimensional object of great beauty. I remember that as a child, I took a rectangular piece of wood, putting nails in it with a hammer which I would then connect with thread my grandmother used for sewing. I spent hours that way, constructing my imaginary ocean-going vessel, a ship or raft? It was never clear what it might finally become. Luc Coeckelberghs, a painter whose works somestimes become, in a way, three-dimensional and thus sculptural, has created an object that breathes the freedom I found in the imagination-driven creation of my childhood days. Working on wood, and applying a monochrome green verging on turquoise to it, he has again succeeded to give his work a rich surface texture. The piece of wood is elongated. Neither the long nor the short sides of it are running in parallel fashion. The idea of a rectangular work of art is abandoned, it is contradicted in fact. But working on wood nearly as thick as a finger, and being intent to create a texture of color that is palpable, the idea of the plane, thin surface painted on that is so inherent in works on paper and that even works on canvas remain by and large attached to, is also opposed. On the green board with its slightly curved, frontal bottom edge, two green, thick “dots” of color have been applied. To the left, an elongated piece of monochrome blue textile covers part of the board; a small part of this tape-like or ribbon-like textile is black, however. I think that it is probably the original black of the tape which has then been partially overpainted in blue. Counteracting perhaps the blue and black tape, an elongated, triangular, once again black piece of material appears in the opposite side of the green board. It is a thin layer covering part of the turquoise-green surface. The green piece of wooden board rests on another finger-thick piece of wood. It is overpainted in a warm, icecream-evoking tone of beige while an icecream-like ‘strawberry’ pink is applied at its margins. The line that separates the large field of beige color in the center of this piece of wooden board from the pink margins is not straight; quite on purpose it is left to follow its shaky, almost random but not at all nervous course. In horizontal fashion, grey metallic ‘needles’ of irregular but nonetheless similar length stick out from the green board, suggesting something functional. They are 35 in all. Long, thin metal objects. And the gaps between them remind me of keys of a piano while the grey ‘needles’ remind me of the gaps between these keys. 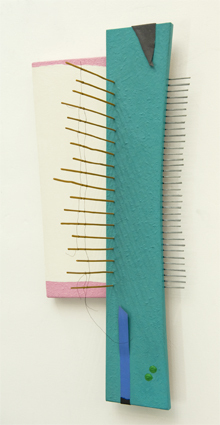 Close to the edge of the green board – an edge that forms the visual boundary between this board and the beige and pink one – , light brown, thin ‘sticks’ spring up from the turquoise-green surface. They are lined up in parallel fashion. They are of clearly very unequal length, and they are connected by two lines of thin, dark metallic thread. One piece of thread forms a curve reaching almost the bottom which is the green board; another piece of thread, forming a nearly parallel curve, sets out to do the same but then ends abruptly in mid-air. 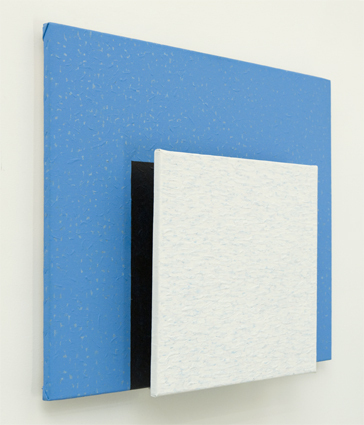 The object thus constructed, made up largely of two flat, painted pieces of wooden board that are attached to each other while overlapping slighty, reveals what is also present in other works of Luc Coeckelberghs that somehow still echo, to a greater or lesser extent, traits of two-dimensional paintings. It shows a love of monochrome colors and their combination, their relation; also a longing for the concrete, as revealed by texture. But at the same time it is protruding more clearly, still, into three-dimensional space. 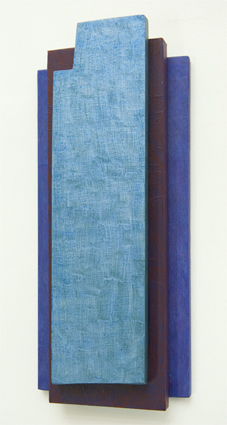 In this poetic, very painterly object, the ‘needles’ and ‘sticks’ – the first protruding horizontally from the work, the latter vertically – seem to emphasize even more radically Luc Coeckelberghs’ quest to liberate painting not only from the square or rectangular shape of more conventional paintings but also from that basic two-dimensionality which is only timidly transcended when, for instance, thicker layers of color are applied. The poetic quality of this object has much to do with its implicit rejection of functionality which is so apparent exactly because the work is challenging the eye of the spectator through the suggestion of (mock) functionality. But such poeticism in itself is not new. It can be traced back to Schwitters and others, and re-emerged later in some art works of the ‘60s. The blue square!, my eye (or was it my imagination?) shouted. But it was not a square, of course; it was a rectangle in intense blue, with a white square inserted into it. The blue has the intensity of colors I have seen in works by Helen Frankenthaler. The idea of pure geometric forms goes back to Russian constructivists, of course, and to Josef Albers. But the blue canvas hovers above the white wall in Luc’s studio, and this is due to a wooden support below it that is about an inch thick and of distinctly smaller dimensions than the rectangular panel which presents its blue surface. As for the white square that stands out in front of the blue canvas, I notice that it is attached to the latter by two metallic bows that keep it at a distance. Like the blue rectangular canvas ‘hovers’ above the white wall, the white and square canvas ‘hovers’ about four inches above the blue one: a fact that is very palpable when the viewer confronts the work. Incidentally, stepping closer, I see that the part of the ‘blue canvas’ that is visually underneath the white square, is not blue at all. It has been painted starkly black. If we stand in front of the work in a way that lets us see it slightly from the left (or the right), we will see a very thin, black, vertical rectangle separating the blue and the white of the work. Cowering, we will see a slim, black horizontal line between the whiteness and the blue, and also two broad stripes or bands of metallic silver that reveal the presence of the two bows keeping apart the white panel and the blue, while attaching the former to the latter. The construction of this object that is a painting existing on two levels & protruding so clearly into space tells us a lot about Luc Coeckelberghs’s determination to free painting of its conventional two-dimensionality. But such two-dimensionality is also challenged by the texture created, a rich texture, not at all ‘minimal’ or ‘minimalistic.’ In this work, the artist executed the texture in extremely painterly fashion by creating a wave-like pattern in that white square which at a first glance seemed so abstract. I discover the repeated presence of a very light, very pastose blue continually intermingling with the white surface tone. Thick, tiny patches of such blue color, they are, next to small patches of quite plane surface in white. And they remind me of myriads of small fish swimming in a white ocean, or of small blue waves maybe, covered by white crests. It’s a canvas worked on meticulously by the artist, rich in detail when looked at closely but nevertheless suggesting whiteness when standing further away. A whiteness, however, that is not abstract, pure white, but rich and alive with the vibrations of its texture, its uneven surface. Conversely, the blue, rectangular, almost square canvas we see “under” the white square, projecting to the right and left side of it, as well as below and above it, is not as evenly and abstractly blue as it seemed to be at first sight. It holds thick patches of blue color inside, or rather on top, of its plane blue surface. They are patches that again remind me of little fish springing in the water. Silvergrey tiny patches of color are distributed at random across the blue surface, as well. A work of great simplicity, that is what it is indeed. But not as simple as our propensity to abstract, to ‘look’ rather than ‘see’, may suggest. *** And certainly richer, in many respects, and more intense than I could perceive in the very first moment. Joseph Albers taught some of us to see colors, and to love their intensity, their specific presence, their interrelationhip; all of this, we know, for its own sake. This has never been easy to accept for those who want to speak about our time and place, our world, our social reality, class society, class relations, class struggle. But colors are also part of the world, this all but peaceful and just and humane world we inhabit. And the sense of beauty in us, or the loss of it, its withering away, are social facts. And so it is revolutionary perhaps, in a certain respect, to re-kindle a sense of beauty, the ability to perceive beauty that is so often neglected or suppressed, aborted in fact, by rotten circumstances and sad neglect. When he created the work I want to speak about now, Luc Coeckelberghs composed an object – I must add, a painterly object or object that is a three-dimensional painting – by combining three basically monochrome canvasses, one mounted on top of the other. The topmost canvas shows an intense ocean green, the green of very clear, unperturbed waters on a sunny day. It is a rectangle; it is mounted on the other two in a vertically way, thus constituting what is called a vertical format. But the pattern inscribed in the texture of the color filling this monochrome green canvas runs, more or less, in a diagonal direction. I add ‘more or less’ because there are these ‘deepenings’ next to ‘ridges,’ these ‘hollows’ in the texture produced by the artist. They are traces of scratching that left long thin marks of a somewhat lighter green-blue.And they do indeed produce the impression of a diagonal pattern but nonetheless they don’t seem to run exactly parallel to each other. A certain sense of oscillation or vibration is produced by this texture, by the multiplicity of scratched marks, the traces of scratching quietly but determinedly, often in a way that lets lines converge or cross each other. Blue-greens and darker blues and light blues, in haphazard, random fashion, are engaged in an interplay. The next layer of the work is constituted by a canvas that is only partly visible: it protrudes in slightly diagonal fashion from underneath the bluegreen, strictly vertical, rectangular canvas while it is standing out, at the same time, in front of the third, horizontally placed canvas. This third canvas forms in a sense a counterweight (if not counterpoint) to the horizontal canvas to the left of it. It is a rectangle and, as I said, it has a horizontal rather than vertical orientation. Its height is a bit less than that of the blue-green vertical rectangle. And therefore, its upper edge is lower, and its lower edge higher than that of the canvas to the left. Thus, a somewhat irregular rather than rectangular, but nonetheless geometric outline of the entire work composed of these three canvases results – an outline that is composed of straight lines and eight corners, in all, which are, in each case, encompassing an angle of 90 degrees. The whole work appears as very balanced; even the fact that, as a second layer, a diagonal canvas has been inserted, does not disturb this balance: it adds a dynamic effect but it does not unbalance the composition. Having sketched rather briefly the general composition of the work, it is time to turn back to the second (slightly diagonal) canvas. It shows a basically dark blue color – at first sight monochrome, just as the blue-green rectangle appears at first sight as monochrome, and as the canvas forming the bottom layer of the work seems to be at first sight monochrome, too. 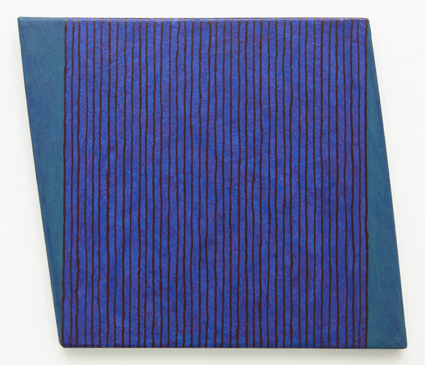 But the dark blue that is the basic color of this slanted canvas is enriched by thin blue lines which are running in almost parallel fashion next to each other. And even more so, its tranquility that might have been discovered by the onlooker if the line patterns had been lacking, is reduced if not aborted by the very dynamic course of other, black lines that form a wave-like pattern and that are considerably farther apart from each other than can be said of the faintly visible blue lines. Also, like snow, tiny white dots appear in the blue. 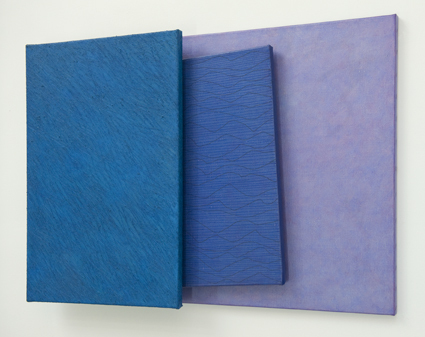 The texture of the last, violet canvas, is the most regular one. Here we come closer to a truly monochrome surface than in the other canvases forming the work. ‘Clouds’ of reddish violet hazily merge with ‘clouds’ of a lighter, bluer violet. 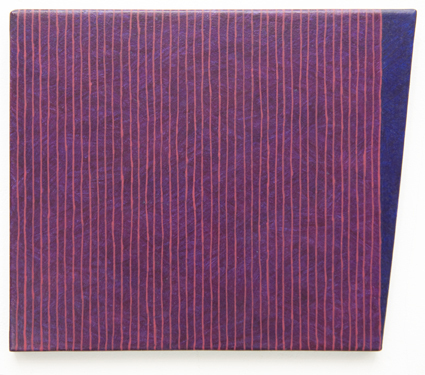 No threads of black add a faint sense of ‘three-dimensional’ texture, nor do scratches emphasize microscopic three-dimensionality, in the case of this violet rectangle while its visible presence is somewhat overshadowed by the diagonally intruding second panel. The overall impression of the entire ‘object painting’ I have just discussed is one of dynamism, dynamization, if you want. It is due, above all, to the protruding blue-green, vertical panel that shatters the ‘rectangularity’ of the outline of the entire work. And due also to the diagonally inserted second panel. As a counterweight, the third and thus bottom panel (visible to the right of the vertical one), provides rest and a necessary measure of stability. The apparent closeness of the main colors (blue-green, in case of the first canvas, dark blue, in case of the second, and violet, in case of the third) to something that we could call ‘monochrome;’ counterbalances to my mind the observed dynamics, as well, thus producing a sense of harmony, of serenity. It is the texture of the surfaces, especially in the case of the first two panels, that makes us aware that this isn’t conceptual or minimalistic art tending towards the ‘clean’ and abstract. But art made by an artist who is seeking to preserve the richness of colors, and their material sensual presence. If his more recent paintings have become constructions of more than one panel, constructions that reach into three-dimensional space and that approach an object status that is almost sculptural, this in turn confirms the impression that this is the result of a quest for the ‘real,’ for ‘materially’ very present art, for works that are never ‘clean,’ ‘cold’ and ‘pure’ and always richer in texture and color than they appear to be at first sight. Perhaps it is this quest which drives the artistic production of Luc Coeckelberghs in his present phase of development. * The complexity of the work is not only to be traced to the mere fact that three panels have been mounted on top of each other. It is also a result of the size of each panel and the way these panels have been mounted. And it is further increased by the outline or shape of the uppermost panel. If we look at the way the panels have been added, we find that the bottom one is a rectangle, wider than the other panels. Above it is another rectangle, more narrow but higher and projecting over the bottom and top edge of the panel below it. The uppermost panel is the most narrow one of them all, and it even appears to be slimmer than it is. While ts lower edge is situated above the lower edges of the other two panels, its upper edge, being slimmer than the lower one, projects over that of the panels beneath it. Given that the panel has left and right sides that run straight and exactly vertical, how can the upper, exactly horizontal side be shorter than the bottom, horizontal side? The solution is that the rectangular shape of the uppermost panel has been obstructed. It has five corners. And although four of its sides run either horizontally or vertically, one, very short side, is slanted, ascending very slightly, from the left to the right. ** I may have sensed it already before I stepped up to the painted surfaces, but remained unaware of it, registering it ‘merely’ pre-consciously. *** A brief look is of course enough to say, aha, hm, yes I recognize it as a blue rectangle and a white square. Enough to think of Albers, for instance. But as Viktor Šklovskij pointed out, recognition, the brief look that lets us recognize may be the opposite of seeing, of truly seeing. The first amounts to automatized perception. Art, if it challenges us to see, furthers the de-automatization of the aesthetic perception process. Perhaps such de-automatization of aesthetic perception is a fundamental trait of all true art, whether “committed” or “uncommitted.” This type of de-automatization may well be a prerequisite for further and more far-reaching de-automatized cognition. If we switch from the question of pure form, which was so decisive for Russian formalists like Tynjanov, Ejchenbaum and Šklovskij, and turn to that other, just as vital social need to de-automatize the cognition of historically produced, changeable and changing social relations, we arrive of course at Brecht’s conclusion that “making the supposedly familiar look strange” is necessary if we are to overcome engrained prejudices and preconceptions, in other words, the “dominating mode of thinking” which reflects the positions (and thus class interest) of the dominant social forces.